/// Demonstrating more queries and how the execution can be deferred even when chaining queries from multiple classes. /// I'll be using LINQ lambda queries for these demonstrations. // Demonstrating the use of a method call to a lambda query that gets all the employees of a department by the department ID. // The lambda query makes it so that call can be pretty clean, short, and simple. // and continuing the filter with another lambda query by the employee name length. // This shows that deferred execution works with a lambda query. This example is using the same code from the repositories as the Query Composition post. The only difference is I’m using Lambda queries instead of composition queries to look up all the employees by a particular department. The other method further looks for all employees in a department and whose names are greater than six characters. This post and the next one I’ll be demonstrating how you can use helper methods with queries in them. Then how you can call on them in another query in a seperate class. This example will show Query or Comprehension syntax. So what happens when you need to sort the data from a query? The orderby, ascending, or descending keywords come into play. I’ll also be showing how to create LINQ lambda queries to perform the same tasks as a comprehension LINQ query. 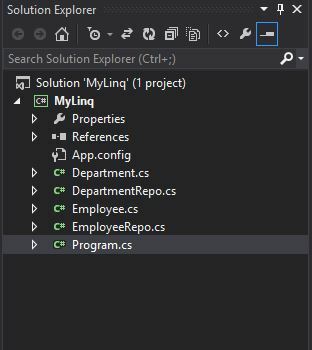 The LINQ keyword Joins. This keyword gives you the ability to join data properties, database tables, etc.., that don’t have any kind of association. For example say you have tables with ID properties in two database tables without any kind of association from a database perspective. What the join keyword can do is join the two ID properties of the tables together to run queries on. There are three types of Joins I’ll be showing here. Normal Joins, group joins, and cross joins. All of them will be using query syntax. I’ll be demonstrating method syntax in some later examples. Again if you’re confused about the terminology of the different query types use this. Query = Comprehension Syntax, Lambda = Method Syntax. Another set of keywords useful in the LINQ language is the Let and Into keywords.